How to Host Your Own Backyard Cinema Night! Now that the weather is starting to warm up again, there’s no excuse to stay inside for your next movie night! Imagine laying back on the grass with a few blankets and pillows, surrounding by friends and an abundance of snacks, watching a movie in your very own backyard cinema! Perfect, right? Well lucky for you, we know just want you need to make this perfect night a reality. Once you have the essentials, let’s start setting up your backyard for the ultimate movie setting for your friends and family! Firstly, and arguably the hardest step, is setting up your material as a screen. Make sure you pick a spot that works, between two trees works wonderfully if you’re lucky enough to have them conveniently placed in your backyard. Alternatively you can use a veranda or in a pinch a clothesline. Just make sure you can tie it across the top and at the bottom so it’s nice and taught. Keep in mind you will need room in front of the screen to lay back and relax, and perhaps a lot depending on how many people are free for a flick! Once you have your screen in place, set up a table and set up both the projector and the connected laptop. You’ll then need to change your screen settings to be displayed on the projector and adjust until the picture on the screen is as straight, clear and sharp as possible. It will also be worth investing in some speakers so everyone can hear the movie! Now for the fun (and the most important in our opinion) part, you get to choose a movie to watch on the big screen! Depending on the crowd and the type of night you’re having, you could go with a classic family (and kid friendly) film such as Frozen or one of these. If you’re planning a girls night in, there are so many options to choose from for the perfect dose of drama, cocktails and fun.. Check out this list from Cosmopolitan for inspiration. When it comes to blankets and pillows for your backyard cinema; there’s no such thing as too many! Load up the area with blankets, large and small pillows, some bean bags and maybe even a few chairs at the back. You really want to create a warm inviting atmosphere, so if you need a few extras there are plenty of affordable options at Kmart or Target. Be sure to keep some spare blankets available in case it gets a little chilly in the evening! The final ingredient for an amazing backyard cinema is snacks! Firstly it’s not a movie experience without popcorn, so make sure you have plenty of that on hand in some nice big bowls for easy access. You can go all out with chocolate and lollies, or take a healthier (or at least more mature) and opt for a platter of cheese, dips and strawberries to snack on with a nice glass or red. We absolutely LOVE these trays for a stylish (and stable) platter at ground level. Either way, you’ll want to have plenty of snacks on hand so you don’t miss the plot twist running to the fridge or grocery store! 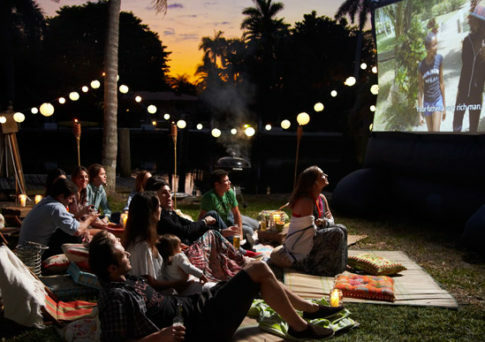 It’s very simple and easy to set up your very own backyard cinema and spend the night in the backyard with your sweet smelling turf, trees, air and friends and family! If you need help transforming your backyard with turf, call our team at Go Turf. We supply Wintergreen Couch, Palmetto Buffalo, Empire Turf and Sapphire Buffalo. We have found that these varieties are the best for Queensland’s weather and cater for all budget’s and lawn needs.